It is really quite refreshing to find another Angeleno who is not only patriotic but on the vanguard of an economic patriotism rarely seen around these parts. Bron Heussenstamm, the founder of Alex Maine (meaning “defender of the homeland”) is serious and is doing the very thing that I’ve been growing hoarse ranting about. Bron has dedicated his business to making high-quality, cutting-edge men’s clothing entirely in the US. You don’t know how many times I’ve been in boutiques from LA to Los Vegas where prices may be double those on Alex Maine but where everything is nevertheless made in China. Have you seen Diesel or even Prada goods sporting the made in China label? So I’m quite proud of and impressed with Alex Maine. They have a new flagship store on 8025 Sunset Blvd. in Los Angeles, as well as allied retailers. You can also buy Alex Maine goods at their web store, AlexMaine.us. 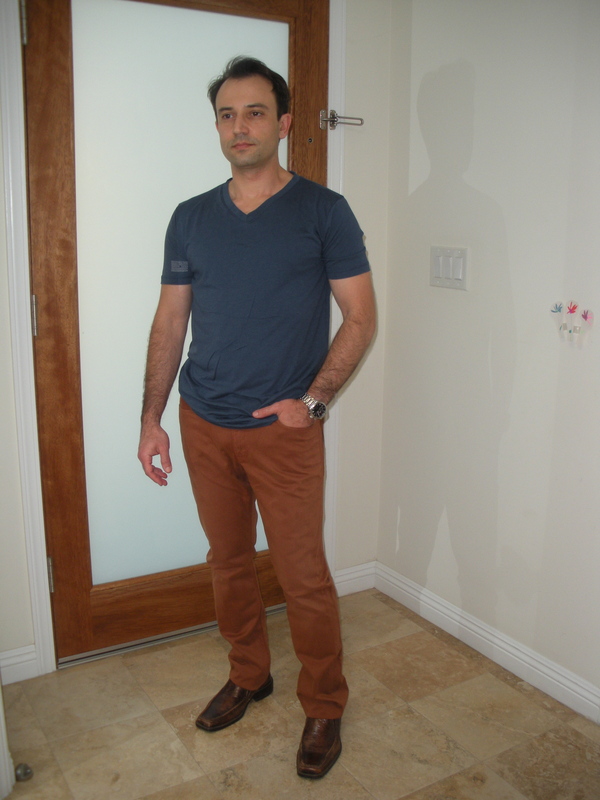 I am reviewing a pair of slender cut twill pants and a bamboo cotton v-neck shirt. They look quite nice, and I would probably have picked these up had I recently been shopping on Sunset Blvd. The construction is excellent and the feel of the material very smooth. I highly recommend! At this time, a mere 3% of US clothing and textiles are made in USA. Surely we can do better than buying over 97% of our clothing from overseas. Factories will continue to outsource production overseas until consumers stop buying their imported crap. So it’s time for the US consumer to put out or get out – don’t buy at Target – buy at places like Alex Maine! China seems to practice dumping of under-priced goods to purposely drive it’s international competitors out of business then follow this up by doubling and tripling prices. Case in point: rare earth minerals. Currently China produces 95-99% of the world’s rare earth minerals which are used in high-tech devices. This is essentially a monopoly. Prices have gone through the roof and China has been restricting supply to foreign competitors. At the same time, it is waving the carrot of access to its rare earth supply if foreign companies locate their production in China (so that China can then appropriate their intellectual property and production capital as well). However, China only has 1/3 of the world’s rare earth supply. In the 80’s the US supplied a major share but mines were driven out of business by low-priced minerals that flooded the market from China. Now that China has squeezed the supply and raised prices manifold, these same mines are in the process of reopening, but the damage to our industry has already been done (just look at our economy these days). Of course China will surely repeat the process once international rare earth production gears up. Another example is with fluorescent lighting. Cheap Chinese fluorescent lights flooded US markets in the last 2 decades. They drove domestic manufacturing out of business. (Remember how getting energy-efficient was supposed to be good for the US economy, according to Obama? Well, it just sent money to China.) Now that they have done so, they have jacked up prices by double, and that’s just the beginning. I know this from personal experience in buying fluorescent lighting for my business. So when you buy Chinese goods for their low-price, just remember what you are doing. You are destroying domestic competition in favor of Chinese goods dumped on our shores at below-cost prices. As soon as they have driven your countrymen out of business, you will be paying more than you were before the Chinese. Just think about that the next time you decide that all that matters is price. Economics and trade are more complicated than that. Ahead of the much-anticipated Obama “Jobs Speech,” I wanted to share some thoughts in the vein of the Madeinusablog. We have had stimulus after stimulus and tax cut after tax credit yet the unemployment rate has hardly budged, and possibly gotten worse. QE1 and QE2 only seemed to help banks and temporarily inflated stock prices but seem to have done nothing else. The classical Keynsian economic thinking goes that during an economic recession, it’s a good idea to empty the government coffers and take on some debt to stimulate economic growth through public works. In turn, these public works improve infrastructure and future productivity, thereby paying for themselves in the long run. In the short-run, these stimulus measures cause job-creation that cascades into additional supporting jobs and other jobs through increased consumer spending power. However, in the modern US economy, this is where the equation breaks down. In the past, those extra consumer dollars then enriched the US economy. More consumer dollars meant more jobs at Ford and Honeywell. More jobs at Maytag and Hewlett Packard. More jobs at Fieldcrest and Hanes. More jobs at Gillette and Proctor and Gamble. What about now? Instead of translating all the extra demand into extra production (jobs) in the US, those dollars are being spent on products produced with foreign labor. Not only are consumers spending their money too often on foreign companies’ products, by buying Toyota cars and Lenovo computers, but American manufacturers are outsourcing every chance they get to same on production costs and stay competitive. So all those extra dollars borrowed for tax breaks to corporations and consumers just don’t help. Even infrastructure projects too often use imported materials, especially in building products. So all this net outflow of cash only compounds the problem by not leading to net increase in hiring while at the same time increasing the long term tax burden by increasing the national debt and its attendant interest payments. c. minimum made-in-usa percentages for supplies bought for state and federal government contracts. You may argue with me about the “fairness” of reducing worker and consumer protections, but it would put American manufacturing on more of an even footing with our Pacific Rim and Latin American competitors. I welcome feedback on this!